Bromeliads (bro-mee-lee-ad's) belong to a specific plant family... Bromeliaceae, which has approximately 3000 species and hundreds of hybrids, are native to the Americas, except for one species. This one exception is found in Africa. There is evidence that it may have come from the Americas long long ago. Bromeliads are one of the larger plant fanilies horticulturally... and one of the most diverse plant families in the plant kingdom. Bromeliads are seed plants and do not reproduce by spores. These seeds are enclosed in an ovary (not a conifer) or angiosperm. It is a monocotyledon... or one leaf on the sprout and the leaves have parallel veins. The flowers have petals, which are all alike, so identification can be the flowers and the parallel veined leaves with scales. The scales is what distinguishes bromeliads... which is very unique. This scale, which is called "Trichomes" allows the leaf to collect water. 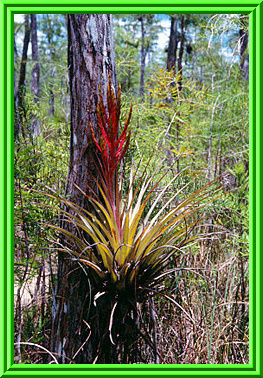 The southern United States has many native bromeliads and are protected by conservation laws. Spanish Moss or "peles hair" is the oldest known bromeliad and is found indigenous to the southern United States... the Pineapple is the only edidble one. In mature, many bromeliads grow on trees or rocks as epiphytes (air plants). Their roots are used mainley for support and they are not parasites. Other bromeliads grow as terrestrials... growing on the ground and getting nutrients from their roots. Bromeliads are easy to grow and have hundreds of varieties, shapes and color combinations. (a) Bromelioideae... (b) Pitcarinioideae... (c) Tillandsioideae. From there, bromeliads are divided into groups called Genera... fifty-two total. The majority of the plants in each genus have the same cultural requirements, there are exceptions of course. Different genera require varying amounts of light, water, air movement and temperature. The most common genera in cultivation are (1) Aechmea... (2) Billbergia... (3) Cryptanthus... (4) Guzmania... (5) Neoregelia... (6) Nidularium... (7) Tillandsia... (8) Vriesea. Bromeliads are a great choice in flowering and foliage plants for interiorscaping, as well as accenting landscape designs. In the last twenty years, bromeliads have become the plant most sought after because their flowers and foliage lasts so long... they require very little care... are drought resistant... and are very hardy. Bromeliads are primarily tropical plants, and most of the species found here in Florida prefer warm humid conditions. The amount of rainfall in South Florida during many months... the plants ability to withstand dry conditions for long periods... and the geological conditions that maintain humidity in the drier months in South Florida, all contribute to bromeliad growth. In addition, the mixture of tropical and temperate plants in south Florida's hammocks and swamps, provides the appropriate canopy conditions needed by some species. The distribution of bromeliads in Florida is primarily determined by temperature conditions. Frost limits most of the states native bromeliads and during years of severe cold weather, populations of cold-sensitive species can be reduced substantially. Every decade or two, severe frost kills back populations of bromeliads in north and central Florida... establishing the northern range limits on the species there. Florida's rarest bromeliads (Guzmania monostachia, Catopsis nutans, Catopsis floribunda, and Catopsis beteroniana) are restricted to the southernmost region of the state. These species also have very specific humidity and shade requirments... restricting them to certain habitats with appropriate canopy and geological conditions. Of Florida's 16 species, 13 are not found anywhere else in the United States... and one, (Tillandsia simulata) is found only in Florida. The populations of Florida's bromeliads are distinct from the West Indian bromeliads from which they orignated. There is also genetic variation among populations of certain species here in Florida, particulary Tilliadsia fasciculata. All of Florida's native species of bromeliads are epiphytic, although some species may sometimes be found growing terrestrially (Tillandsia utriculata and Tillandsia fasciculata. The most distinctive characteristics of bromeliads is the presence of trichomes... the grey scales on the leaves that allow the plants to absorb atmospheric humidity, as well as some nutrients. Only a few species in the genus Navia seem to lack trichomes. The flowers may seem varied, but all have three sepals and three petals, as well as six stamens. The flowers have both female and male parts and the seed pods also display this three part symmetry. Bromeliads are herbaceous plants... having no woody tissue. The inflorescence (flower) arise from the main axis and therefore stops any futher growth of that rosette. Bromeliads are monocots... having only one seedleaf (cotyledon). If you are unsure what a cotyledon is... sprout a bean... which is a dicot, and notice the pair of seedleafs. Bromeliads being monocots, have the veins in their leaves running parallel. * Puya - From the Mapuche Indian (Chile) word meaning "point"
* Ursulaea - For Ursula Baensch... plant breeder and co-author with her husband of "Blooming Bromeliads"
South Florida has a subtropical climate, with pronounced wet and dry seasons. A mixture of temperate and tropical plants and animals occur in a variety of communities. 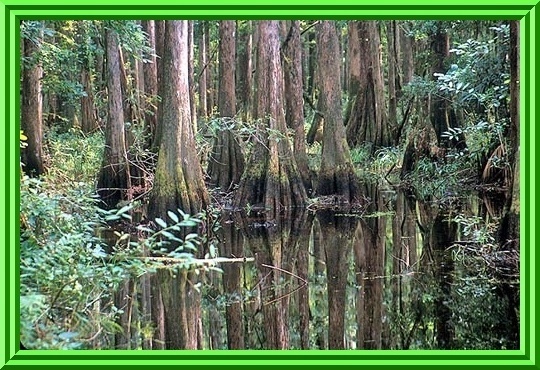 South Florida lies at or just slightly above sea level and, changes in altitude of only a few feet can result in dramitic changes in the plant communities. 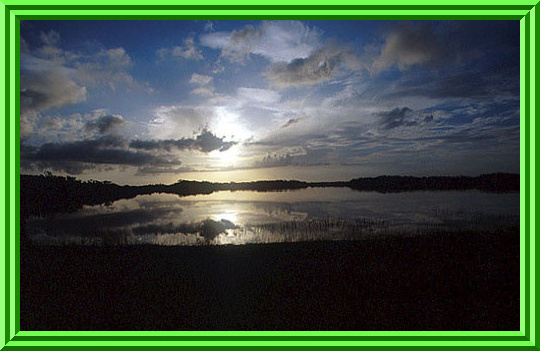 The Everglades region is primarily a saw-grass marsh with slight elevations in its lime-stone rock foundation. These "hammocks" support communities of tropical hardwoods, which in turn support many of the state's native bromeliad populations. Bromeliads can also be found in sloughs containing cypress swamps, in dwarf cypress domes among the prairie ecosystem, or in the drier upland pine flatwoods. Large areas of these unique communities are protected in parks in southern Florida, but development and man-made hydrological changes have threatened many of these areas not under public control. Epiphytic bromeliads have highly restricted habitat preferences, in large part based on their ability to absorb nutrients from specific environments. Some species are only found where humidity and canopy conditions are just right. Bromeliads generally prefer moist habitats that are well lit, although requirements vary by species. Many species are most commonly found near rivers, lakes and ponds. Bromeliads will rarely colonize all potential host plants within a habitat. Florida's species of Tillandsia are often found on oak and cypress trees, whose rough bark provides a suitable substrate for seedling attachment, as well as hackberry trees. Hackberry and live oak trees have many spreading branches that provide a large area for epiphytic growth. Tillandsias prefer host trees that branch considerably, have a thick, rough bark with enough crevices to hold seeds and do not produce chemicals unfavorable for seedling growth. For example, seedlings are noy able to develop on many tropical trees such as camphor because of the chemicals produced by the trees. Old dune with deep fine sand substrate; xeric; temperate or subtropical; occasional or rare fire; sand pine and scrub oaks and/or rosemary and lichens; Tillandsia balbisiana. Upland with deep sand substrate; xeric-mesic; temperate or subtropical; rare or no fire; live oak and/or laurel oak and/or other oaks; sparkelberry, saw palmetto; Tillandsia flexuosa, Tillandsia fasciculata, Tillandsia utriculata. Old bar or storm debris with sand/shell substrate; xeric-mesic; subtropical or temperate; rare or no fire; buttonwood; mangroves; mixed halophytic herbs and shrubs/trees; Tillandsia flexuosa. Stabilized coastal dune with sand substrate; xeric-mesic; subtropical or temperate; rare or no fire; mixed hardwoods and/or live oak; Tillandsia flexuosa. Indian midden with shell substrate; xeric-mesic; subtropical or temperate; rare or no fire; mixed hardwoods; Tillandsia flexuosa. Flatland with exposed limestone substrate; mesic-xeric; subtropical; frequent fires; south Florida slash pine; palms and/or hardwoods; mixed grasses and herbs; Tillandsia fasciculata, Tillandsia balbisana. Flatland with limestone substrate; mesic; subtropical; rare or no fire; mixed tropical hardwoods, often with live oak; Catopsis berteroniana, Catopsis florabunda, Guzmania monostachia, Tillandsia flexuosa, Tillandsia variabilis, Tillandsia utriculata, Tillandsia fasciculata. Wetlands dominated by plants adapted to anaerobic substrate conditions imposed by substrate saturation or inundation during 10% or more of the growing season. Includes non-tidal wetlands; tidal wetlands with ocean derived salinities less than 0.5 ppt and dominance by salt-intolerant species; small shallow water bodies without wave-formed or bedrock shoreline and, inland or saline wetlands. Broad, shallow channel with peat over mineral substrate; seasonally inundated, flowing water; subtropical; occasional or rare fire; pop ash and/or pond apple or water lilly; Catopsis beteroniana, Catopsis nutans, Guzmania monostachia. Broad, shallow channel with peat over mineral substrate; seasonally inundated, flowing water; subtropical; occasional or rare fire; cypress and/or willow; Catopsis florabunda; Guzmania monoshachia, Tillandsia fasciculata, Tillandsia pruinosa, Tillandsia balbisiana, Tillandsia variabilis. Expansive intertidal and supratidal area occupied by woody vascular macrophytes; black mangrove; buttonwood; red mangrove, and white mangrove... which may include various epiphytes and epifauna; Catopsis berteroniana, Tillandsia flexuosa.